In January, I wrote about a book release party and concert I attended and had promised a review of the book once I read it. Because of other reviews I had committed to write, it was a number of weeks after the concert before I had time to read this book. Then it took me quite a while to read this book. Not because it was boring or hard to understand, but because there were so many spiritual lessons contained in the book, that I would read one paragraph several times, highlight it, underline it, put an asterisk beside it, before moving on. Desperate Hope: When Faith in God Overcame My Despair is one of the most phenomenal books I have ever read. I’ve written book reviews before and I’ve used words like “great,” “excellent,” etc. but I’ve never used “phenomenal” until now. Desperate Hope was written by Candi Pearson-Shelton and it chronicles her family’s journey through a time of great sorrow. It sounds like this is a book about grief. It is not. Yes, the story of Candi’s precious brother, Rick, his illness and his ultimate triumphal embrace with his heavenly Father at the young age of 23, is woven throughout this book. Included in this book are some of his journal entries. When he became too sick to write, Candi or other family members took over. There are comments in response to those journal entries from friends, relatives and people who never met Rick in person. Hundreds, thousands of people were greatly affected by his life and witness, especially through those journal entries posted on a website to have people praying for him 24/7 and to share his testimony. Rick’s motto was “Either way, I win.” He meant, of course, that if God chose to heal him here on earth, he would joyfully remain here with his family and continue his work for God. If God chose to heal Rick by bringing him home to Him, that was definitely a win! Yes, you will need a few Kleenex. But still, it is not a book about grief. It is a book about hope. There is no doubt in my mind that God used Candi Pearson-Shelton as His vessel to bring the message of His hope to this world. His anointing is all over this book from the moment you pick it up and begin reading until you turn the last page. It is a book that will change your life. If you are grieving the loss of a loved one, this book will give you hope. If you are depressed or ill, this book will infuse you with hope. If you have lost your hope—your faith, God will graciously restore your hope and faith through the words He wrote by Candi’s hand. And if you simply want your faith to grow more, this is the book that will cause your faith to grow. I feel like I have not done Desperate Hope justice in this review. It is my earnest heart’s desire for you to understand that Desperate Hope is an encouraging, restorative book that offers hope to everyone. Without going into detail, I will say that God used this book to restore my hope and my faith in Him. If you do not win the copy, I encourage you to buy your own. 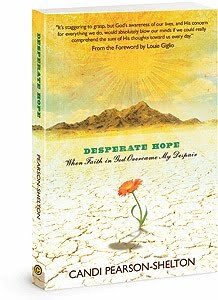 Desperate Hope can be ordered online from Amazon, Barnes and Noble and ChristianBook.com. Thanks to everyone for your kind comments.Carrie, we are called to pray for one another and to share each other's burdens. I am so glad you are surrounded by a community of believers who can help you! Thanks to all of you for your kind comments about the blog!! I knew Rick personally as he was the worship leader at my church. He taught us so much and made us all better people! I can't wait to read Candi's book!! I have heard similar comments about the book but have not seen it. I have been reading "Streams in the Desert" AGAIN and am ministering to two people through it. This seems like it would be an excellent complement. Thanks and certainly enjoyed your post. I have been following your blog for some time. I enjoy your insights Please enter me in the drawing for Desperate Hope.